Every year during WrestleMania, Twitter is split completely down the middle. On one side, you have people tweeting passionately about a fake sport; I’m typically in that group. On the other side, you have people complaining about that first group clogging up their timeline by tweeting about a fake sport. My general stance is that you can’t really help what you’re into, and so long as it somewhat conforms to society’s norms, you should embrace it. There are blogs out there dedicated to Garfield comics without Garfield in them, or inserting images of Drake into scenes from Breaking Bad. And I think that’s totally fine. Who am I to judge? I collect ski caps with high school basketball logos on them. This isn’t to say I believe it screams normalcy for a 34-year-old guy to enjoy watching men in Speedos pretend to fight with each other. But I cling to the belief that there’s a difference between me and the infamous “IT’S STILL REAL TO ME, DAMMIT” guy. I have a relatively legitimate job with a livable salary, I’m married to a lawyer and I appreciate a cup of tea and a good novel. It’s just, I happen to think wrestling — for all its at-times egregious flaws, the steroids and misogyny and whatnot — is a tremendously entertaining form of television. When you watch a really well orchestrated match — to me at least — it’s an adrenaline rush on par with a great NBA Finals game. And somehow, wrestling is one of the only things I liked as a kid that I still really enjoy now, along with Spider-man, Batman and blue cars. Don’t get it twisted, though: I’m fully aware that wrestling is totally ridiculous. Though it has its share of self-reverential nonsense — Triple-H, in particular, takes himself way too seriously for a guy who literally slept his way to the top — it often can’t help but make an unabashed mockery of itself, usually by design. My job for the past decade or so has consisted of a bunch of guys sitting in a room watching sports, frequently until very late at night. Unsurprisingly, our evenings often would devolve into the same pastimes: quoting the Simpsons and swapping wrestling YouTube links. One night a few years back, my friend Brad Kallet, now a web editor for CBS New York, sent around a link to one of his favorite wrestling moments, the WrestleMania VIII press conference, which I watched live when I was 13. It was kind of a niche moment; it has fewer than 1,000 views on YouTube, 100 of which are from me. But we had a good laugh, and with “The Showcase of the Immortals” this weekend, I decided to revisit it. The WrestleMania VIII presser was quite different from the mainstream media fluff they have nowadays. It kind of had a sketch comedy vibe: A bunch of “reporters” waited for WWF President Jack Tunney, some random old guy, to announce which of the five top contenders would face Ric Flair for the WWF championship at WrestleMania. Hogan inevitably gets the nod from Tunney, while the four other contenders demonstrate varied levels of disappointment. (Most notably, an irate Sid Justice attempts to tear up his speech, though he somehow fails.) Generic backstage reporter Sean Mooney then conducted a couple of tremendous interviews with notable also-rans, which are chronicled below. Shortly thereafter, for a variety of reasons, Savage was switched into the world title match against Flair, who subsequently claimed to have photographic evidence of a prior relationship with his beloved Elizabeth. Sid would turn on Hulk Hogan and set up a terrible main event match; at least it culminated in the surprise return of the Ultimate Warrior, which my middle-school friends and I celebrated like the messiah had arrived. 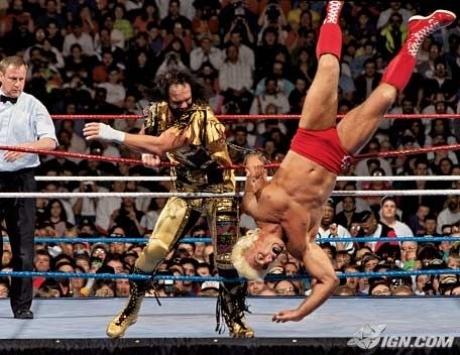 You went from OK-with-the-news Savage to, after beating Flair for the title at WrestleMania VIII, Savage screaming, ‘This is just a piece of what I wanted from you, Ric Flair!’ And he ended the interview tearing off his glorious golden Mania attire after reminding Mr. Perfect that nobody is indeed perfect. Also, anyone who says WrestleMania VIII was a disappointment can go jump in a lake. Savage/Flair as a feud/match was better than anything Flair/Hogan would have likely ended up being, and you got the bonus of the Warrior returning at the end of the Hogan/Sid mess, which made for a helluva ending to the event. HISTORY WAS MADE IN THE HOOSIERDOME. First of all, there was a press conference. In WWF. To name the No. 1 contender at WrestleMania. If that isn’t brilliant in itself, I don’t know what is. The fact that “members of the esteemed press,” as Gene Okerlund puts it, are in attendance is fantastic. Clearly this was the biggest news event of 1992. Presidential election be damned. On the right-hand corner of the dais is none other than the massive Sid Justice, who bears a striking resemblance to Steve Sanders from “Beverly Hills, 90210.” Dressed in an awful blue-and-white jumpsuit, Justice is convinced that he’ll be chosen by “President” Jack Tunney to face world champion Ric Flair in the title match at Mania. After all, he did place second to Flair in the Royal Rumble. 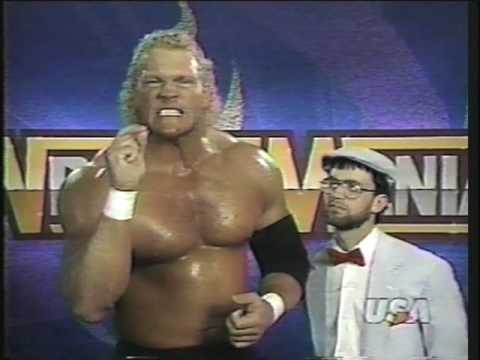 Inexplicably (not inexplicably at all), Tunney gives the nod to Hulk Hogan. A furious Justice rips up the papers he’s holding in front of him (a thank-you speech?) and growls as Hogan accepts the honor. To this day I’m dying to know what Justice had written on those papers. We’ll never know, unfortunately. 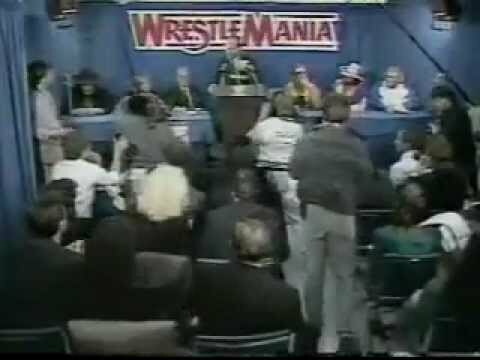 After the Macho Man graciously accepts his defeat in the post-press conference interview, Justice gets his opportunity to speak with reporters. As expected, Justice expresses his discontent. In arguably the greatest interview in WWF history (as far as unintentional comedy goes), Justice proclaims, “Now what you did, Jack Tunney, was BOGUS. The most BOGUS act you’ve — ever pulled off.” Kudos to Sid for using the word bogus twice in rapid succession. Also, what other “bogus” things has Jack Tunney done? Do we even know? And is he really the president? I always just assumed he was a janitor who worked in Stamford that Vince put a suit on whenever they were light on actors. Justice also complains that Hogan was chosen because the Hulkster is a movie star — likely early promotion for Mr. Nanny, which would be released a year later. He also proceeds to remind the audience that he does, in fact, rule the world. In case you’d forgotten. It must also be noted that Bobby “The Brain” Heenan has some stellar lines in the roundtable discussion following the interview. When I say stellar, I mean his words make little to no sense. After eloquently stating that Hogan “is the greatest sports attraction in the history of sports,” Heenan accurately adds that “he’s probably done more for charities and human beings and everything in this world.” Well said. Now that I’ve been revealed to be the third-best writer on my own blog, I’ll share my personal favorite part of this press conference: the Undertaker, who sat stoically on the left side of the dais. He didn’t move a muscle the whole time, and then hilariously offered literally no reaction when he wasn’t selected for the main event. That moment right there crystallizes why I still love wrestling after all these years: An undead zombie sitting on a podium next to faux Scotsman Rowdy Roddy Piper in front of a bunch of fake reporters, awaiting a bogus executive’s ruling on who gets to wrestle a middle-aged man in a scripted match for a fake championship at a fake sporting event. If you don’t get why that’s awesome, well, that’s BOGUS. But if you love it as much as we do? Feel free to check back for our upcoming in-depth analysis of the time Chucky from Child’s Play confronted Rick Steiner.